Colt's horrible day ended well. 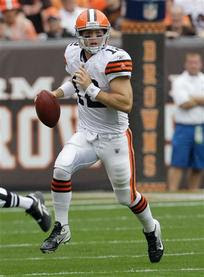 If winning cures all ills, then Colt McCoy must be feeling good right around now. A two-minute, 80-yard, game-winning drive does plenty to make you forget about the 58 minutes of indecisive, skittish quarterbacking that preceded it, but it would be foolish to simply slap a colorful Band-Aid on what was until those last moments a sickly performance from the Browns' gunslinger. Let me rattle off a few excuses first: McCoy was without Peyton Hillis while his best playmaker was effectively gimped by a groin injury. The offensive line sans Eric Steinbach is either still gelling or is just plain cheesecloth as a unit, as McCoy once again found himself scrambling outside the pocket under pressure, forcing throws off his back foot and often behind intended receivers. Still, McCoy's first instinct seems to be scrambling his way out of the pocket and making throws on the run. There's going to need to be a time when he can consistently make those passes dropping back in the midst of a collapsing pocket. More disquieting was the lack of poise McCoy displayed, something that has not been much of an issue in his short career. Maybe it was that skittishness that led to the accuracy problems our guy was having from the opening gun. The first miss to Josh Cribbs, who gimpy or not was five yards behind the nearest defender, was a play that needs to be made ten out of ten times if you're an NFL quarterback. While not as egregious as the Cribbs gaffe, McCoy also missed Greg Little and Ben Watson on two other plays that would likely have gone for big yardage. As frustrated CST founder/webmaster Brian mentioned in a text, McCoy, at least in the early going this year, has had trouble hitting a receiver in stride downfield. All too often today the offense looked out of sync. Most of McCoy's throws were delivered everywhere but square in the wideout's chest. Watching the Browns' offense was even more maddening because of the glimpses of gold that gleamed from the pile of hay. The opening drive of the second half saw McCoy quickly and decisively snap off the quick passes that are the staple of the West Coast offense. His two touchdown tosses, meanwhile, were perfectly placed balls that couldn't have been caught by anyone but the receiver they were intended for. What gives me optimism that Cleveland may have its answer under center were the bearings McCoy discovered in that final drive. I would have loved to have taken a poll of Browns' fans to find out just how many people believed the team was going to score the winning touchdown from the faraway reaches of their own 20. I sure as hell didn't think it was going to happen, but McCoy's ability to make plays after such an awful afternoon made me happy to be wrong. Instead of plonking bad balls into a double covered Ben Watson, McCoy finally found the receivers who had been absent all game long. So, the intangibles seem to be there with McCoy even if the skill set is a work in progress. But there is still much to be done, and one great touchdown drive should not be the be all, end all indication of health at the quarterback position.